This advanced night cream delivers a cocktail of powerful ingredients to fight the signs of ageing. Our unique CollagenSupport Complex with hydrating ceramides reduces fine lines and wrinkles; retinol improves firmness and vitamin C restores radiance. These ingredients are vital in rebuilding skin’s natural barrier, for healthier, younger-looking skin. I love Paula's Choice products, but this one ruined my face in one application. I had the worst reaction I could imagine - red, itchy and achy face, especially around the eyes (I didn't use it as eye cream, not right around the eyes, but close enough to make me look like a hangover panda). I had no allergies before and have no idea which ingredient caused this disaster, but will def to be more careful with my next order.. Customer Care: Thanks for your review! We're sorry this product didn't work for you, and agree that you likely experienced an allergic reaction to one or more ingredients in this treatment. Should you need further assistance, don’t hesitate to contact our customer care team. I've waited a while before I posted this review, I'm a big fan of Paula's products, although they're getting more and more expensive; this is the most expensive product from the range that I've purchased. I like the pump dispenser, and the cream is a beige colour. It does make my skin feel tighter on application, but that may be a temporary cosmetic effect. I have dry skin and I'm not sure I like the matte finish of the cream, I don't like the way it makes my skin look. And I certainly couldn't use this on its own, it's just not rich enough for my dry skin. Given the price, I'm not sure I'd re-purchase. Bought this for anti ageing properties, worried as I have oily/acne skin. However this is a cream that is quickly absorbed and doesn't clog my pores at all. A really lovely product I use every other night using clinical 1%retinol on the other nights. This product is one of my absolute favourites. Not only from Paula's Choice, but of all times. I've worked with beauticians, so my interest in skincare is quite extensive. I use Paula's Choice resist line, and I will continue to use this as my night moisturiser. My skin seems to have improved within a few weeks, smaller pores, more even texture and a nice glow. I love this product! I'm really not sure whether to continue using , I wanted something more moisturising than the Resist Barrier Repair that I'd been using for a while, but my skin after 5 days/nights of using is very dry and flakey ? Customer Care: Sorry to hear that this product isn't working for you. Sometimes (sensitive) skin needs to get used to a new product, maybe it helps to reduce the frequency to every other night? However, if you keep experiencing the same, please contact our Customer Care team for advice. Mrs D - Best yet! I've tried other popular high street products but my skin always improves and stays in good condition using Paula's Choice. I've been using Paula's Choice for 5 years with very good results. Over this time my skin has improved so much that I no longer use foundation even though I'm in my 50's. This latest moisturiser does not disappoint. Really lovely texture. Rich but light on the skin. Skin feels amazing. I purchased this product because I wanted a retinol-containing moisturiser and the ceramides were an extra bonus. The first container didn't work, but the customer service was excellent and replaced it for me. So I've been using it for about a week or so. My findings are: smooth skin in the morning and seems to be keeping blackhead formation (small ones on my nose and chin) at bay. I'm not sure of the firming capacity yet, as it's only been a week. I also have sensitive skin and this is not irritating it at all. I'm 56 and I have to say my skin looks pretty good. Finally, I have a moisturiser that has real benefits and I plan on buying again. Lan - You have to try this! If you're serious about age control then you have to try this moisturiser! Its gorgeous texture left my (combination) skin feeling hydrated and nourished. One pump is plenty and after two weeks I already feel like there's a difference in my skins health and appearance. I feel the price perfectly reflects the formulas amazing ingredients and I'm exited to see further results with continued use. Li - Best moisturiser for oily skin. Don't be misled by the name and the marketing of the product. It is NOT a heavy moisturiser. I find it very lightweight, even for my oily and acne prone skin. Actually, the second ingredient sodium ascorbyl phosphate is a form of Vitamin C that has anti-acne benefit! This product is incredibly effective in reducing post acne pigmentation and brightening my complexion. But I did notice some redness during the first couple days of uses. So boys and girls with sensitive skin should try a sample first. This elegantly textured powerhouse is a moisturiser has changed my skincare game forever. I suffer from both eczema and acne and this is just perfect for keeping my skin soft and glowing. I use something a little more emollient on my very dry patches and don't put too much of it on my most oily parts. It’s great under sunscreen and makeup. I was lucky enough to win the bottle I’m using now but will definitely be reordering. It’s the product I’ve been waiting for. The power of several serums with the hydration of a great moisturiser. Game. Changed. I won this cream from a Facebook live competition. I have only just received the product, and have used it during the day under sunscreen and at night on its own. The cream feels light and non greasy, but it leaves my skin feeling calm and nourished. From my experience it is truly good for most skin types, but maybe truly dry skin would be best combining it with an oil and for truly oily skin I would only use it at night. I am pleased that the cream contains a lot of stabilised vitamin c as it provides good antioxidant protection and the ceramides are great for anyone with sensitive, fragile skin; I have mild rosacea. Finally, the retinol in the product is an added bonus. My skin cannot tolerate retinol in high concentrations but I feel that this product contains enough to improve my complexion, without the irritation I have experienced with prescription retinol or very potent otc retinol creams and serums. Although I received this product for free, I shall definitely repurchase. I cannot wait to try the calm serum and a few other products now. Aqua, Sodium Ascorbyl Phosphate (vitamin C/antioxidant), Cetyl Alcohol (emollient), Ascorbyl Glucoside (vitamin C/antioxidant), Neopentyl Glycol Diheptanoate (texture enhancer), Potassium Cetyl Phosphate (emulsifier), Glyceryl Stearate (texture enhancer), PEG-100 Stearate (texture enhancer), Glycerin (hydration), PEG-12 Glyceryl Dimyristate (texture enhancer), Bis-Diglyceryl Polyacyladipate-2 (emollient), Dimethicone (hydration), Glyceryl Ascorbate (vitamin C/antioxidant), Tetrahexyldecyl Ascorbate (vitamin C/antioxidant), Retinol (skin-restoring), Ceramide NP (skin-replenishing ingredient), Ceramide NS (skin-replenishing ingredient), Ceramide AP (skin-replenishing ingredient), Ceramide EOP (skin-replenishing ingredient), Ceramide EOS (skin-replenishing ingredient), Cholesterol (skin-replenishing ingredient), Caprooyl Phytosphingosine (skin-replenishing ingredient), Caprooyl Sphingosine (skin-replenishing ingredient), Squalane (emollient), Punica Granatum Fruit Extract (pomegranate antioxidant), Pongamia Glabra Seed Oil (non-fragrant plant oil), Glycyrrhiza Glabra (Licorice) Root Extract (skin-soothing), Vitis Vinifera (Grape) Seed Extract (antioxidant), Tocopheryl Acetate (vitamin E/antioxidant), Carnosine (skin-restoring), Panthenol (hydration), Sodium PCA (skin-replenishing), Butylene Glycol (texture enhancer), Sodium Citrate (pH adjuster), Ceteareth-25 (emulsifier), Polysorbate 20 (emulsifier), Ethylhexyl Stearate (texture enhancer), Sodium Hydroxide (pH adjuster), Trideceth-6 (emulsifier), Propyl Gallate (antioxidant), Ammonium Acryloyldimethyltaurate/VP Copolymer (texture enhancer), Sodium Polyacrylate (film-forming agent), Behenic Acid (texture enhancer), Disodium EDTA (chelating agent), Phenoxyethanol (preservative), Caprylyl Glycol (preservative), Chlorphenesin (preservative). What is the CollagenSupport Complex? The CollagenSupport Complex combines the skin-replenishing properties of ceramides with retinol for strengthening support and several forms of vitamin C to help defend against environmental stressors and promote firmer skin. Together, this complex provides the essential building blocks for skin to renew itself and restore its natural barrier. 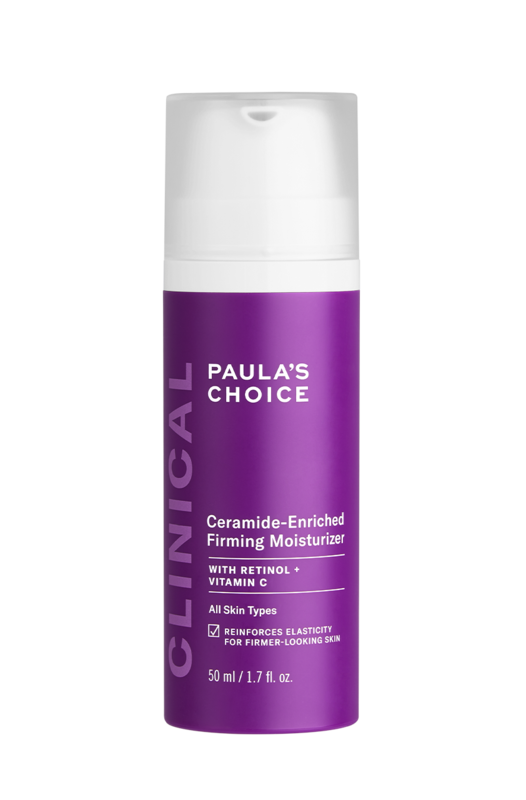 How do Clinical products differ from Resist or other Paula’s Choice product categories? Clinical products offer more enhanced, targeted formulations for specific concerns such as advanced signs of ageing, dehydration or sun damage. Ultimately, it’s a matter of what will suit your needs best. It’s perfectly fine to assemble an anti-ageing routine that mixes Resist, Clinical and any other Paula’s Choice Skincare line that addresses your skin type and concerns. Ceramides are a natural, fundamental part of skin that helps maintain precise levels of hydration, allowing skin to have a smooth, even surface. They’re critical for holding skin together (think bricks and mortar), protecting it from dehydration, signs of sensitivity and environmental damage that chips away at skin’s protective surface. Ceramides are the most abundant part of skin, making up over 50% of its composition. As we age, the level of ceramides in our skin begins to decrease. As a result, the skin barrier weakens, which can lead to symptoms such as irritation, dryness, and redness. Skincare products that contain ceramides (and other skin beneficial ingredients) can help improve these symptoms. This moisturiser can be used on the cheekbones and the under eye area. Avoid your lips, eyelids, lash lines and the corners of the eyes, as these areas are a bit more sensitive and the retinol in the product might cause irritation in these areas. Is this product suitable for rosacea-prone or sensitive skin? This moisturiser is suitable for rosacea-prone and sensitive skin. In fact, as we age, the level of ceramides in the skin decreases. As a result, the skin’s barrier weakens which can lead to things like irritation, dryness and redness. Ceramides along with other skin replenishing/soothing ingredients can help reduce these concerns. Because this product contains retinol, people with rosacea-prone or sensitive skin should start with applying the product 2-3 times per week. Allow the skin to acclimate and then increase as needed/desired. How does it differ from Clinical Ultra Rich Moisturizer? Clinical Ceramide-Enriched Firming Moisturizer is an anti-ageing hero. It has our unique CollagenSupport Complex with hydrating ceramides to fight fine lines and wrinkles, skin-restoring retinol to improve firmness and antioxidant vitamin C to leave skin more radiant. A lightweight lotion to tackle advanced signs of aging. Clinical Ultra Rich Moisturizer also contains anti-ageing ingredients but is more nourishing. It is formulated with replenishing ingredients that strengthen the skin’s barrier to prevent moisture loss and help skin to repair itself. This rich cream helps very dry and eczema-prone skin feel soft and smooth again.